Claudia Marsh (22), Leah Connerty (10), Mia Farnham (29), Olivia Buonopane (18), Paige Pratt (16), and Sarah Katz (8) return to midfield after Mia scored a Masco goal late in the second half. 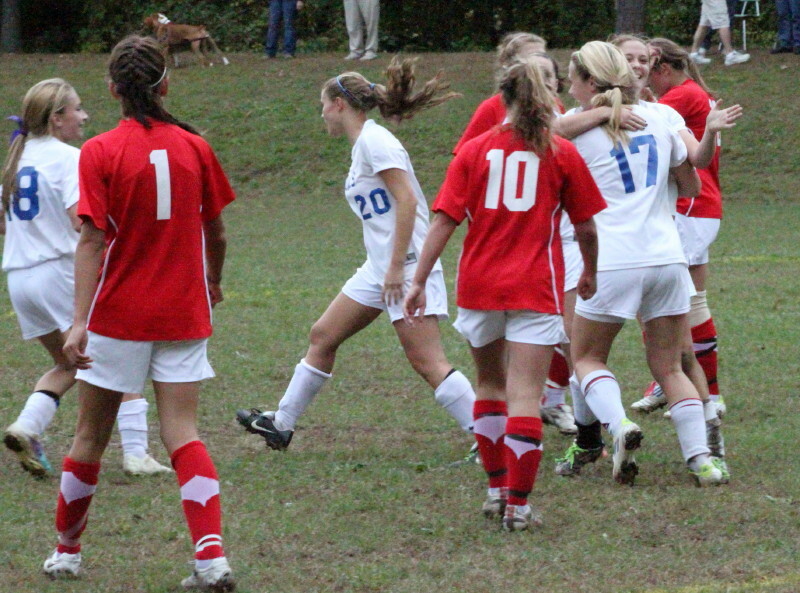 Nicoline Holland (17) gets a hug from assisting teammate Ashley Mueskes. (Georgetown) Two good area girls soccer teams played to a 1-1 tie, as Georgetown (3-0-3) rallied five minutes after a Masconomet (4-3-2) goal late in the second half to net one of their own. The Monday afternoon game was moved just before game time from Georgetown’s lower field to its upper soccer field. There was too much water on the lower field, according to the officials. 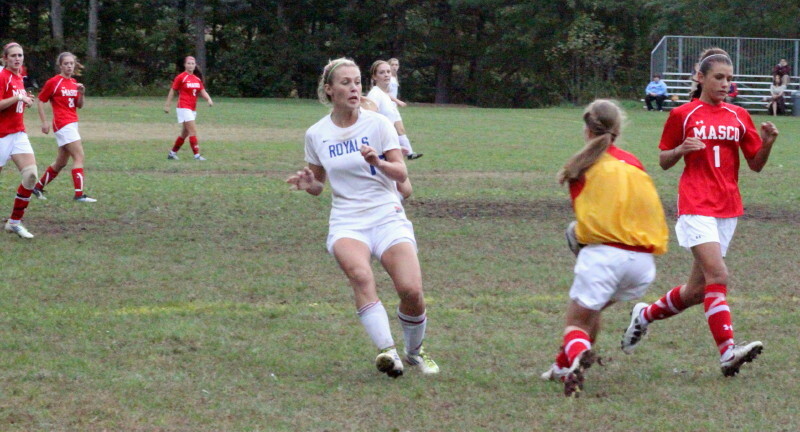 On a cloudy afternoon, Masco had the most shots (17) and the most corner kicks (5) but the Royals had goalkeeper Jamie Block as the final defender. The talented junior turned away several dangerous Chieftain attempts. She also put good distance on goal kicks and punts to give her teammates a chance to regroup. 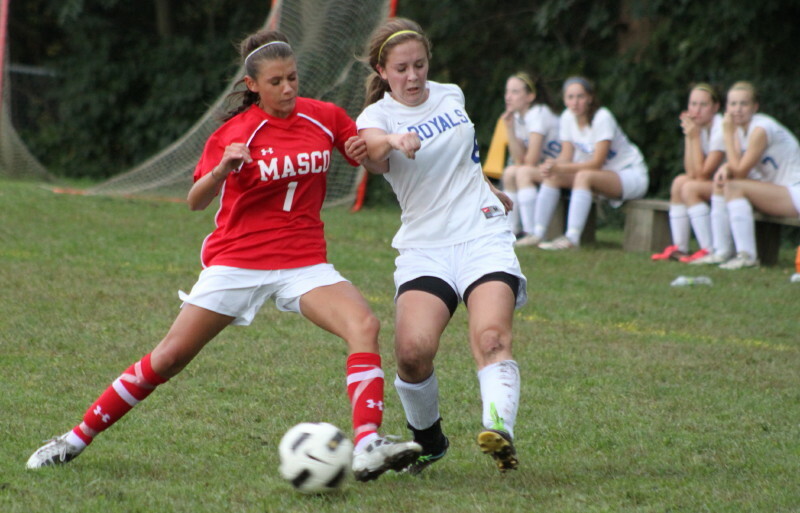 The Royals had defeated Masco, 2-1, in September at Masco in a non-league game. Today’s tie counted in the Cape Ann League’s standings. 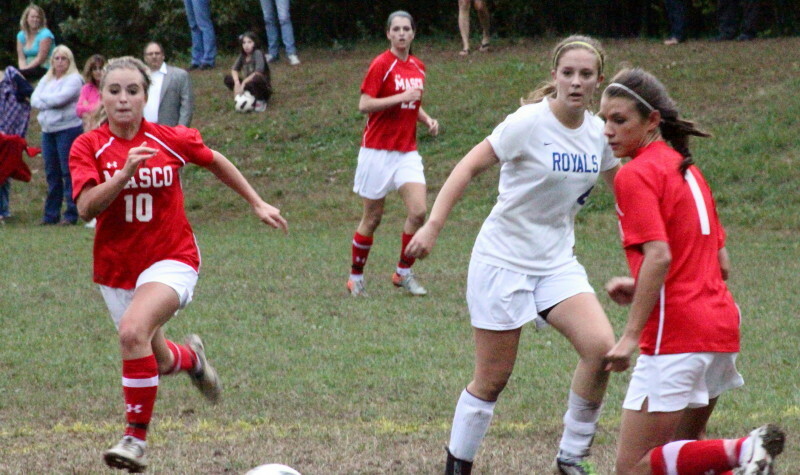 Dominque Anderson (21), Paige Pratt (16), and Alexa Ina (1) prepare to defend a Royal corner kick. Both goals in this game were scored in its last ten minutes. The visitor’s goals came off a Olivia Buonopane’s corner kick from the right corner. Keeper Jamie Block moved toward the near post as the shot was in the air only to have it sail over her head into a crowd of players behind her. Somehow, Chieftain Mia Farnham directed the ball into the net with ten minutes left in the game. 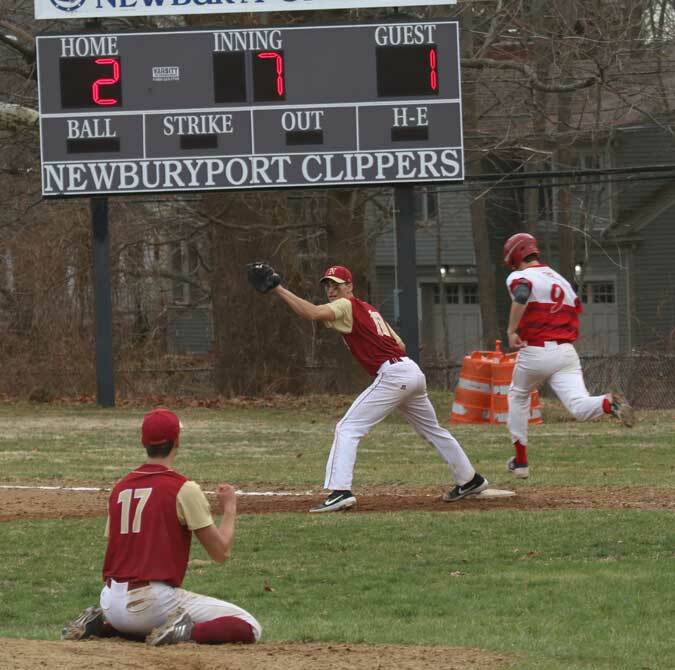 I suspected that Masco might now go into a defensive shell but they didn’t. The Royals pressed hard into the Masco end and got one of their two corner kicks. 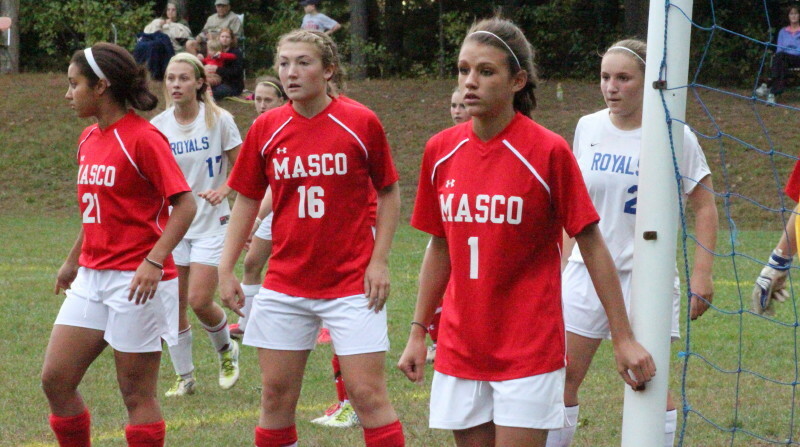 From it, Kelly Chickering drilled a shot from the left that just barely sailed over the top of the Masco net. Undaunted the Royals were back threatening again two minutes later. Kristin Hogan passed the ball into the middle to Ashley Mueskes and the senior co-captain gave her teammate Nicoline Holland as nice a feed as you’ll ever see. Nicoline (90+ career goals) took full advantage of the open side and tied the score with five minutes to go. Ashley Mueskes sends a pass between Alexa Ina (1) and Leah Connerty (10) that set Nicoline Holland up for the tying goal. The memorable moment the rest of the way was Ashley Mueskes hobbling off in the last minute with a leg injury. Georgetown travels to North Reading to face the Hornets at 7PM on Wednesday (October 5th) night. The best player on the field? Kelly Chickering. Undersized but drawn to the ball in the defensive end. Clever and speedy enough to end opponent’s scoring opportunities. 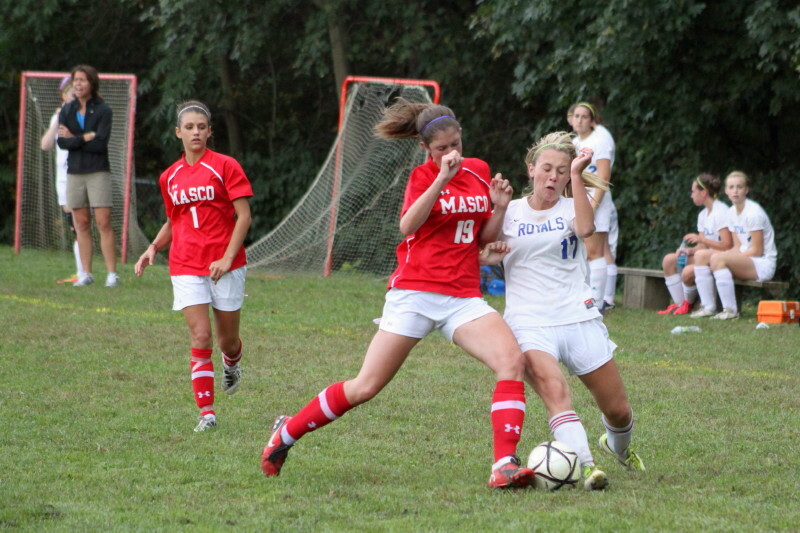 Masco was very good with short passes. 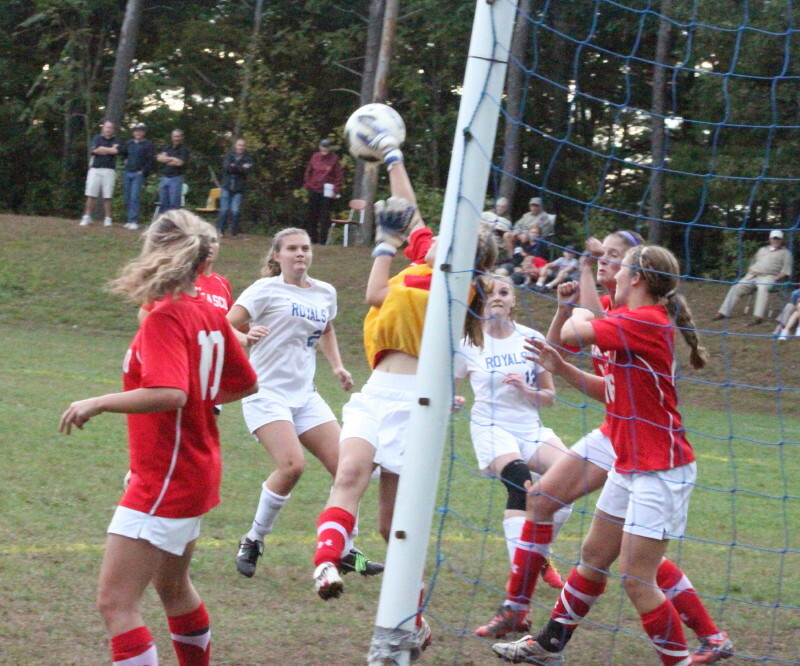 Georgetown ended up with nine shots and two corner kicks on Masco goalie Courtney Bouchard. Division 1 Masconomet was 17-2-2 last year. Division 3 Georgetown was 13-3-2. The pictures will enlarge to normal size if they’re clicked on. Alexa Ina (1) contests with Ashley Mueskes (6). 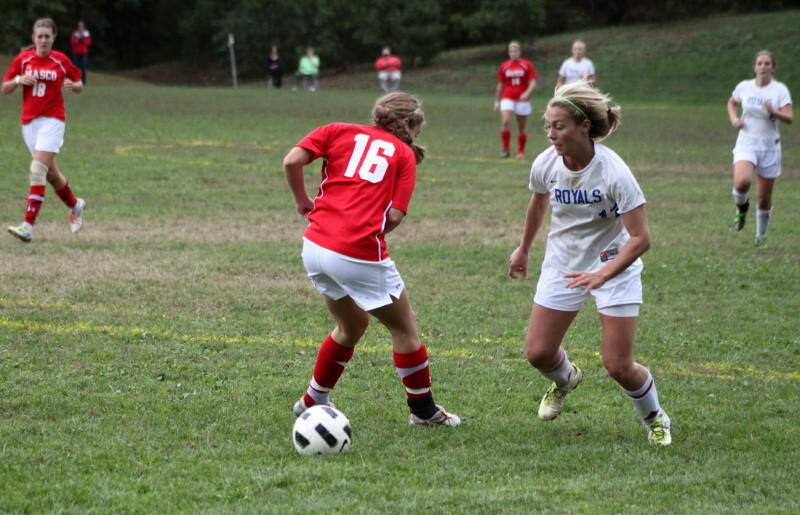 Ashley Federico (12) chases Paige Pratt (16) with Sarah Katz (8) nearby. 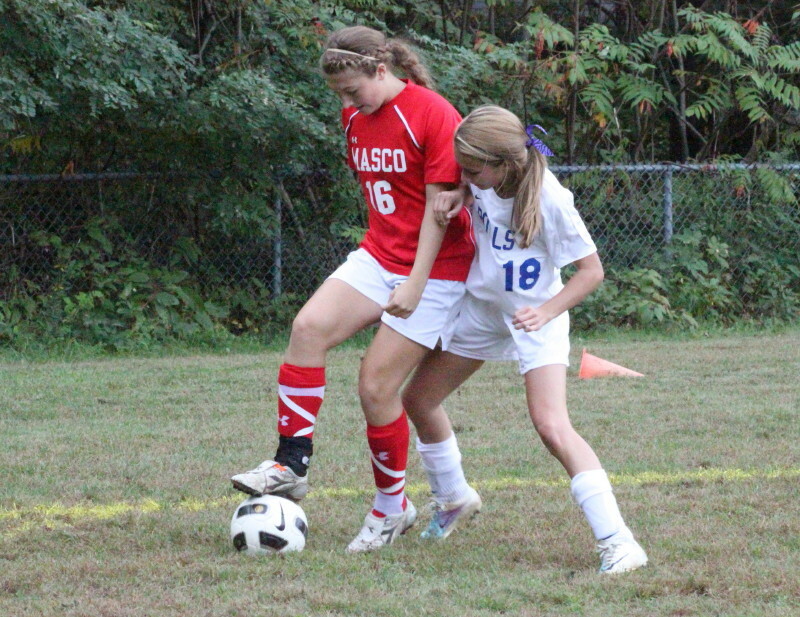 Jen Migliaccio (18) tries to get the ball from Paige Pratt (16). 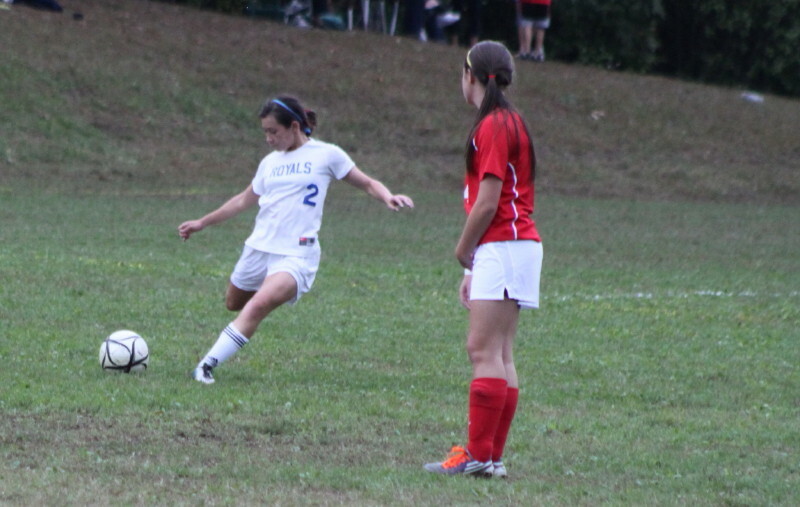 Kelly Chickering (2) sends in a direct kick. 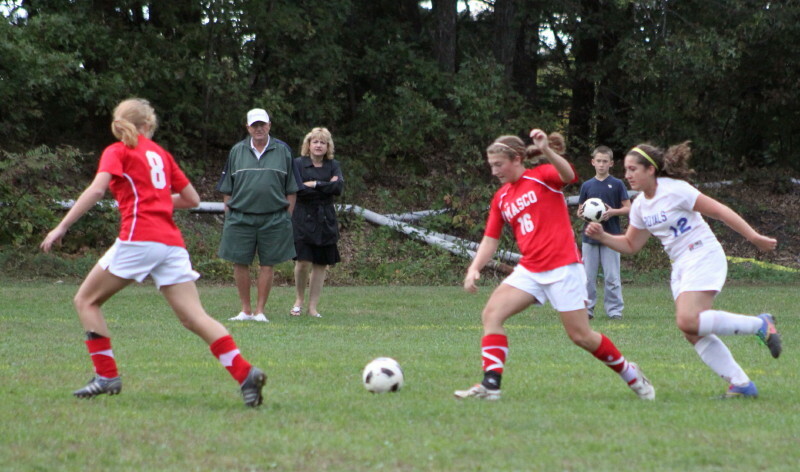 Masco goalie Courtney Bouchard hits the ball out with Kristin Hogan (20) and Katie DiMaio (13) looking for a rebound. Masco goalie Courtney Bouchard makes the save as Nicoline Holland (17) and Alexa Ina (1) go by. Nicoline Holland (17) dribbles past Paige Pratt (16).